You are a student and you are tired of endless tasks. You are a graduate and want someone to write a thesis for you. You are just a person who at some stage of life needs to apply for the services of an online writing agency. Anything can happen, so in any case it is necessary to keep your spirits up, because it can easily be lost, once you are surfing the Net and seeing how many online writing assistants it offers. We have decided to do some analysis of these websites in order to save your time and nerves. Writemyessay4me.org is on the waiting list today. The website is quite ordinary. Unobtrusive colors, the absence of graphic elements that are too bright – all this is rather nice because we are here not to have fun, but to order an academic work. We are pleased with the availability of a verified site account in the PayPal system – all your financial information will be kept in full privacy. There is also an online chat, and the company declares that their customer support is available round the clock. You can contact them via email, Skype, a special feedback form on a certain page or a direct call. It is not specified, however, whether this call is toll-free, so you can expect surprises. The service provides several examples of papers written in different styles. The only thing that is not entirely clear is how to find out who exactly wrote these samples ­– what if you suddenly like one of them. Among other things, the presence of samples can cause confusion in the ordering process: the client might focus on the style that they see in the sample, but eventually get a different writer with his or her own different style. All these misunderstandings may occur if the customer does not specify some details, and if the support team does not ask for them. And all misunderstandings will lead to mutual dissatisfaction. A small misapprehension also arises concerning the team of writers. 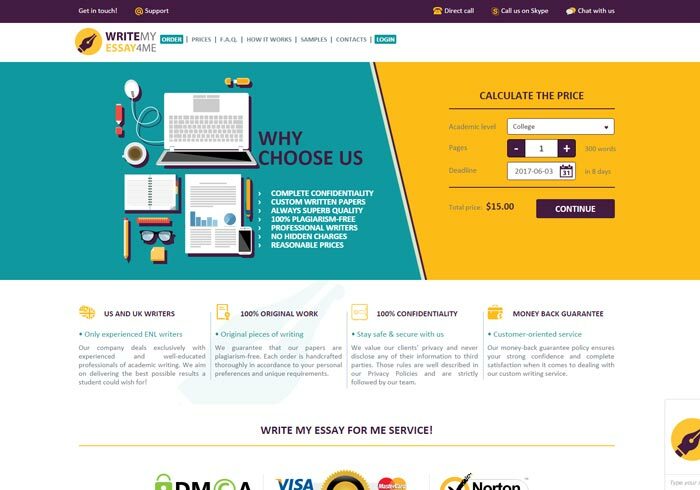 The company indicates that it provides writer’s services, but in addition to the fact that they are experienced, there is no other information. Are they English speakers? Have they graduated from any higher education institution? What topics do they work with, or how many topics can they cover, at least approximately? Will they take up any specific work, for example, graphs, drawings, presentations? Of course, you can ask the support team about all this. However, the most important and fundamental points must be indicated on the website, taking into account the fact that the website is replete with excessive and incomprehensible textual information. Instead of placing canvasses of lengthy information about how to beat the air, they could think a little more about users and give more details and certain nuances concerning their writers and other essentials. Another controversial point of the site is the footer with some people’s reviews – they contain just names and a few praising sentences. But are these people real? No one makes these guys place a surname, place of residence and photo of their customers. However, the most important information about the discipline, the topic and the size of the order is overlooked. The only thing that is still mentioned is when this work was completed. But it is not that valuable in this case.